IISG’s education team will be presenting a workshop for geography and science teachers (grades 4-10) on May 20 at the Peggy Notebaert Nature Museum in Chicago. 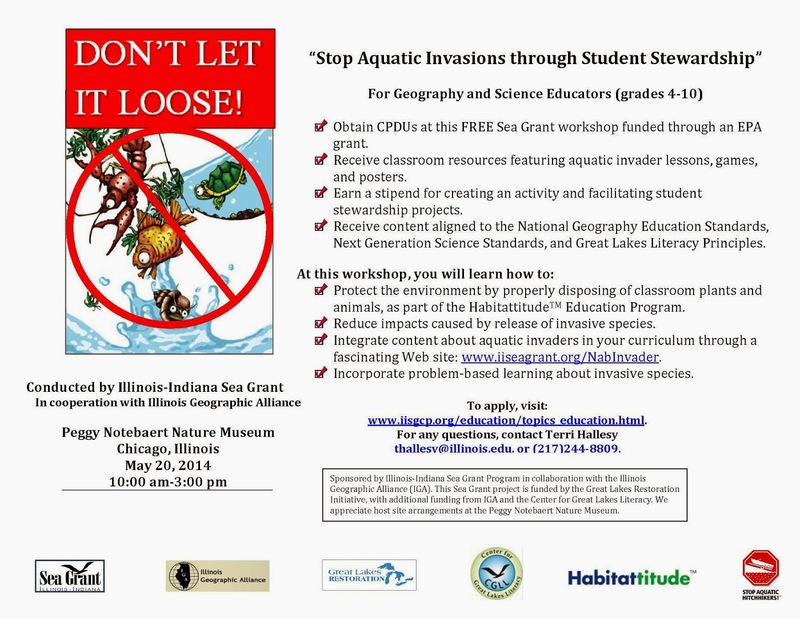 Based around student stewardship lessons and activities, the workshop will offer several resources and examples of how to get students involved in stopping aquatic invasive species. Doing so will allow teachers to introduce crucial science education and Great Lakes literacy concepts in their classes. Lessons and activities for both and inside and outside the classroom will be offered, as well as content aligned with National Geography Education Standards, Next Generation Science Standards, and Great Lakes Literacy Principles. Visit the link above for the flyer and registration form. Registration is open to March 18, but spaces are limited. For more information about the workshop, or with any questions, contact Terri Hallesy.